Now that the boys are doing formula exclusively and are drinking around 7 oz per feeding, it gets quite expensive, especially since there are two of them after all. We typically go through a tub of powdered formula every 2 days. It's insane! A less expensive option that we tried and liked is Comforts For Baby, which still provides complete nutrition that compares to the nutrition of the leading National Brands, but at a fraction of the cost. They offer a wide range of high-quality infant formulas for different sensitivities and allergies. They even have an organic one called Touch of Nature. We tried the Premium Infant Formula ($14) though, which compares to Enfamil Premium Infant. I actually liked that this formula dissolved easier so there wasn't any clumping. I also think the boys liked trying something different, but that could just be me reading into things, lol. Comforts for Baby products are found exclusively in Kroger Family of Stores like Ralphs. For even more savings, go here for coupons. 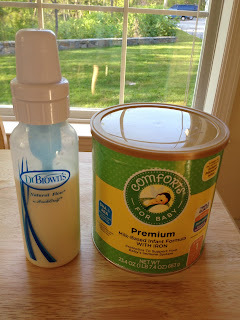 Giveaway: We are also giving away 1 Comforts for Baby Premium Infant Formula and a Dr. Brown's Natural Flow Wide-Neck bottle, just fill out the form below. Good luck!! Meanwhile, just when we mastered formula though, they start solid foods next month! Ahhh! Feed them when they are hungry. It's really crazy how much formula costs. We try to find coupons for them to keep the costs down. Babies with acid reflux should be feed smaller feedings with more frequent feedings throughout the day to avoid too much vomiting, I have found this works better for my baby girl. Do a larger feeding at night so they sleep longer.